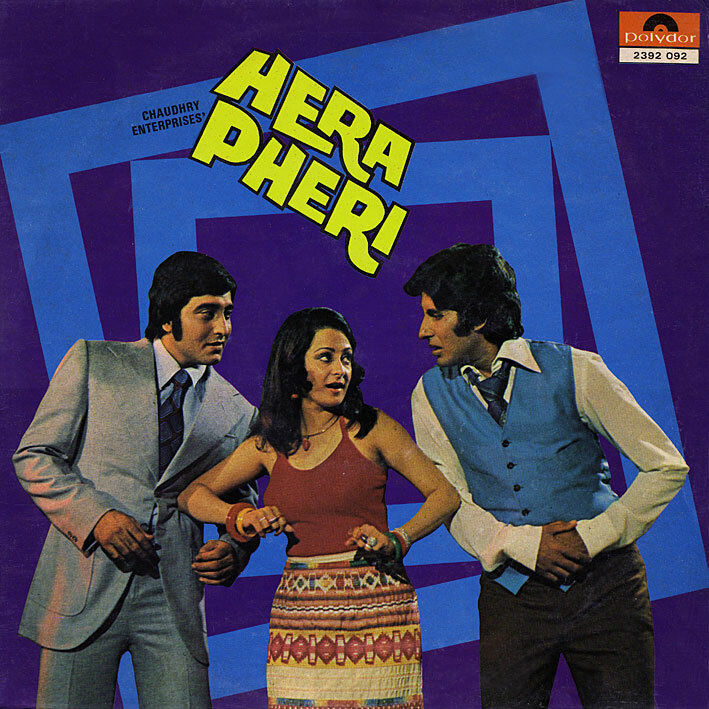 'Hera Pheri' initially came to my attention due to its title music, Kalyanji Anandji's instrumental reworking of Joe Simon's 'Cleopatra Jones' theme. Both original and copy are fantastic blaxploitation workouts, and the latter is undeniably this album's selling point. That said, I'm very fond of Asha Bhosle's contributions to the soundtrack as well; the upbeat and funky 'Aapka Sarkar Kya Kuchh', and the suggestive, sultry sounding 'Mujhe Pyar Me Khath'. There's a great sense of drama inherent in both. Cheers for that - on the basis of a quick look, so does yours! Thanks...excellent soundtrack..I like the very interesting title music and Lata's song best. 'Barson Purana Yeh Yaarana' is one of my favorite/best/underrated melancholy Kishore Kumar songs in existence. Love this album and the film is a trippy fun time as well, thanks for posting! Thanks PC. A couple of good songs by KA. Any more Madan Mohan albums in your collection ?. I always wanted all the tracks from this movie. Hella rare! I donno why but "Barson Purana" sounds a lot like "Jaane Jaana" from Jaanbaaz (1986). Like, specially pay attention to the lines ".....jaise meraa rab rootha" from Barson Purana and compare to "....kya too meraa laage" from Jaane Jaana. Hear anything similar?? Both are KA house productions. Do you also have Barsaat Ki Raat? I have a request. Could you also upload the backsides of the vinyl covers. I like to keep those in my collection as well. Thanx bro as always.. what's cooking up for the future.. awaiting info and pics of the future releases! an underrated KA- Amitabh combo.. that is what Hera Pheri is to me! gr8 line up awaiting us!!!!!!!!!! princeali you can download one of the best combo vinyl (dastak 1970 & dil ki rahen 1973) of madan mohan from my blog.Many more soundtracks also available. But why do the Bollywood blogs never rip at 320kbps? The quality of the recordings is harsh enough and the mp3 compression takes away some of the beauty! any chance you can start uploading in 320kbps? Nope, afraid not. For (amongst others) the reasons outlined here. This is getting tiring to be honest. Which part of "no re-uploads" is it you don't understand?